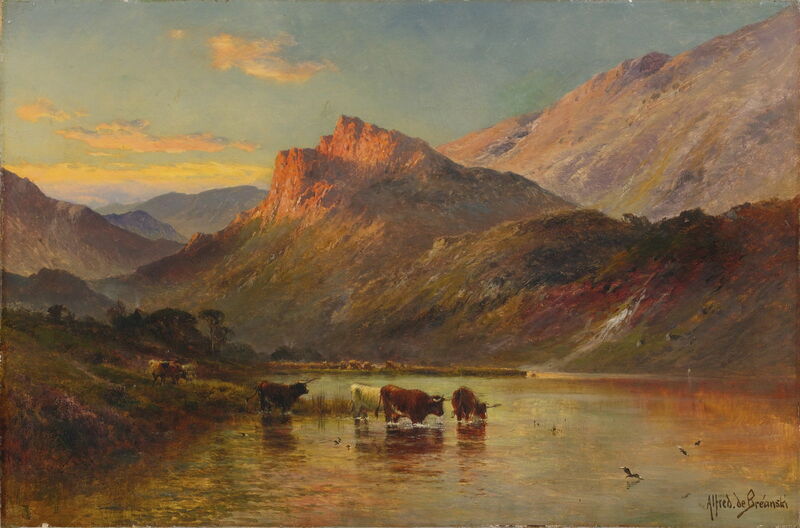 Alfred de Bréanski (1852-1928), Sunset in the Scottish Highlands (date not known), oil on canvas, 61 × 91.5 cm, location not known. Wikimedia Commons. In yesterday’s article, I looked at a selection of paintings from six of Scotland’s best landscape painters, showing views of the Scottish Highlands and Islands. This article casts the net wider, and offers a selection from other landscape painters who visited Scotland. Its most significant omission is JMW Turner, who toured Scotland in 1801 and produced a sketchbook known as ‘The Scottish Pencils’. Although he made some good watercolours from those, in my opinion Turner’s views of the Highlands are among his less successful works. Another visitor, whose influence was of far greater importance, was Queen Victoria. An avid sketcher from an early age, she started to paint watercolour landscapes in the mid 1840s. Her love of the Royal Estate at Balmoral, and of Scotland more generally, was encouragement to many established artists to paint views of Scotland. In the latter half of the nineteenth century, they usually resulted in good sales. Robert Kummer (1810–1889), Scottish Landscape with Fisherman on the Shore (c 1851), oil on canvas, 33.5 x 47.5 cm, location not known. Wikimedia Commons. Little-known now outside his native Germany, Robert Kummer toured Scotland in 1851. Among the resulting works is this glorious view of a Scottish Landscape with Fisherman on the Shore (c 1851). Alfred William Hunt started his career as a classical scholar, poet, and writer, and I presume visited Scotland as an amateur painter in the mid 1850s, before switching to painting full-time in 1861. 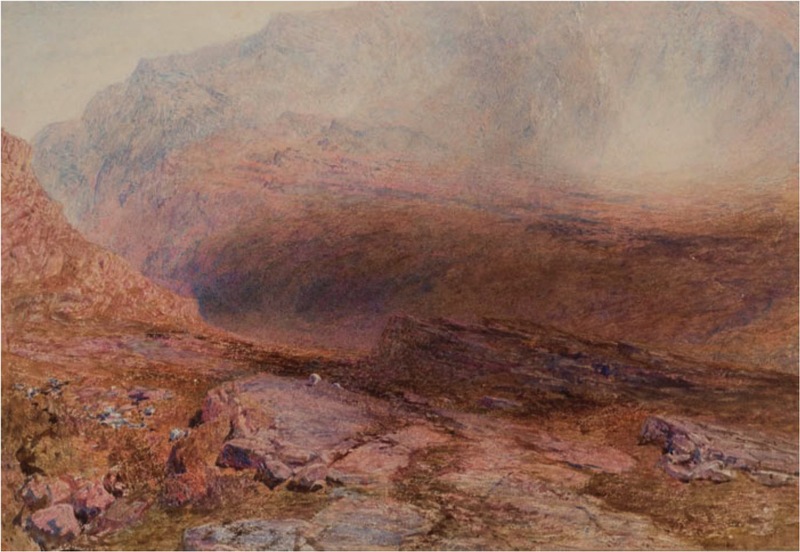 His watercolour of Glen Nevis, Scotland from about 1857 was no topographic view, but an atmospheric impression which seems avant garde for the time. 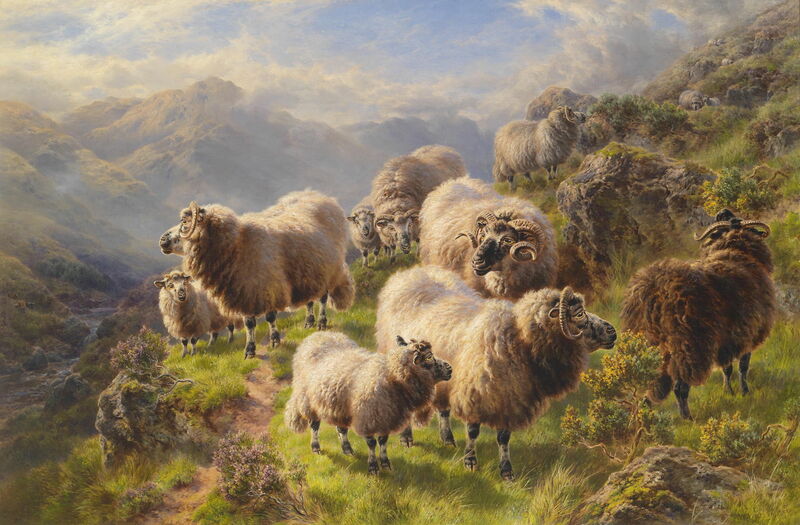 One of the most famous visitors to the Highlands, who fell in love with its land, livestock, and wildlife, was the renowned French animal artist Rosa Bonheur. Bonheur visited Scotland in 1855, during the final phases of the Highland Clearances, which drove much of the inhabitants away, usually to graft and poverty in the lowland cities, or to emigrate. The artist avoided getting embroiled in such controversies, and met Queen Victoria, who was already an admirer of her painting. Rosa Bonheur (1822–1899), The Highland Shepherd (1859), oil on canvas, Hamburger Kunsthalle, Hamburg, Germany. Wikimedia Commons. 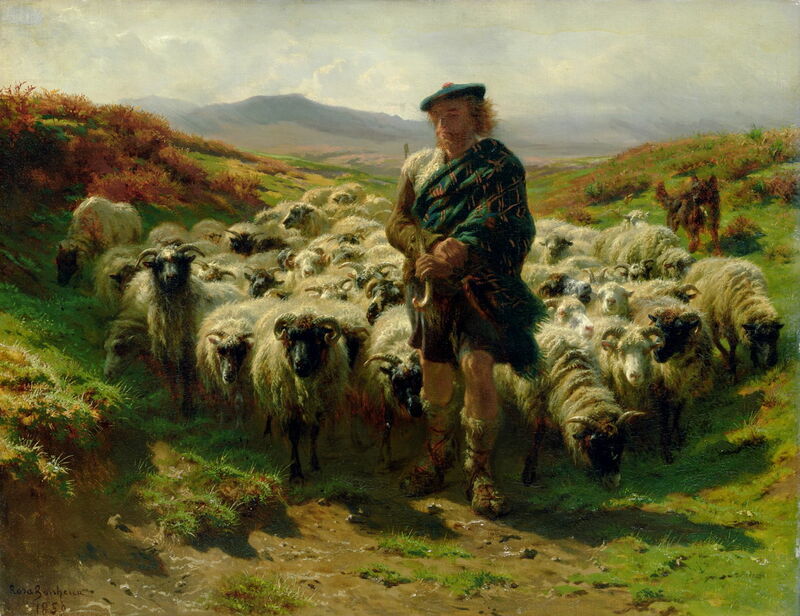 Over the following years, Bonheur developed her sketches and studies into finished paintings, including this romanticised canvas of The Highland Shepherd (1859). Rosa Bonheur (1822–1899), A Ghillie and Two Shetland Ponies in a Misty Landscape (1861), oil on canvas, 64 × 101.5 cm, Private collection. Wikimedia Commons. 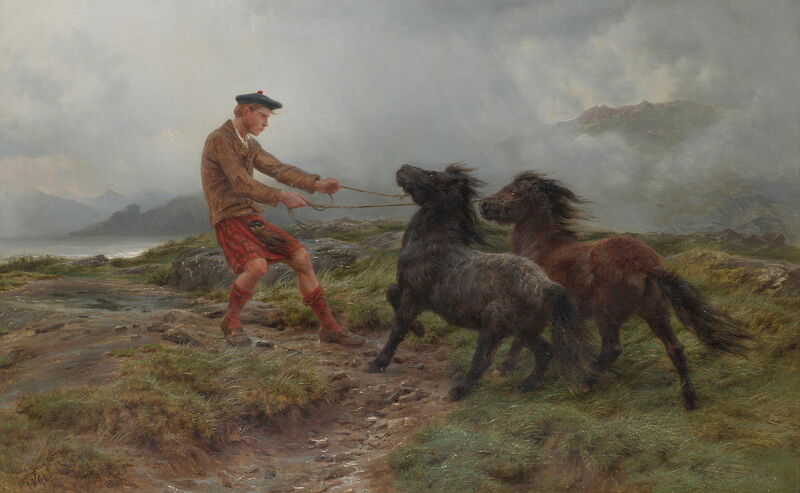 A Ghillie and Two Shetland Ponies in a Misty Landscape (1861) was another success derived from her Scottish tour, and helped ensure that her work was even more popular in Britain than in France. 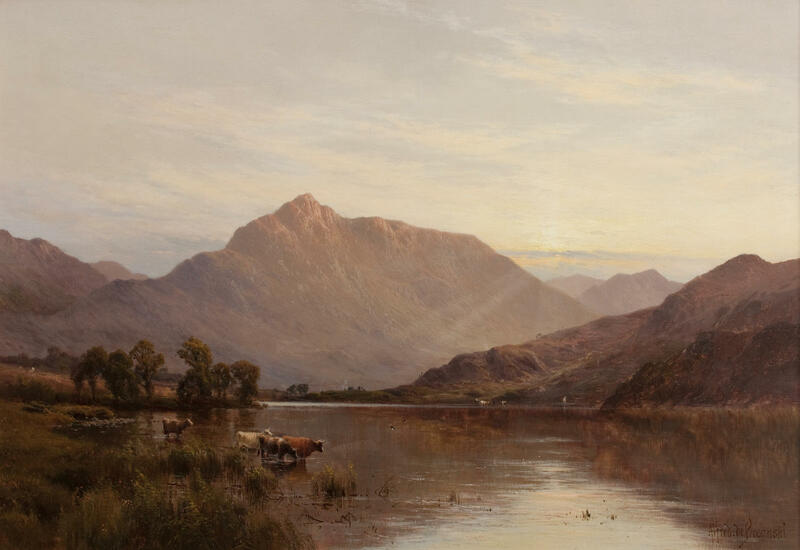 By this time, dedicated commercial landscape painters had recognised the demand for views of the Scottish Highlands. One of the first to develop this market was Sidney Richard Percy, who was originally known as Sidney Richard Percy Williams, and the most successful member of the Williams family of painters, also known as the Barnes School, based in London. 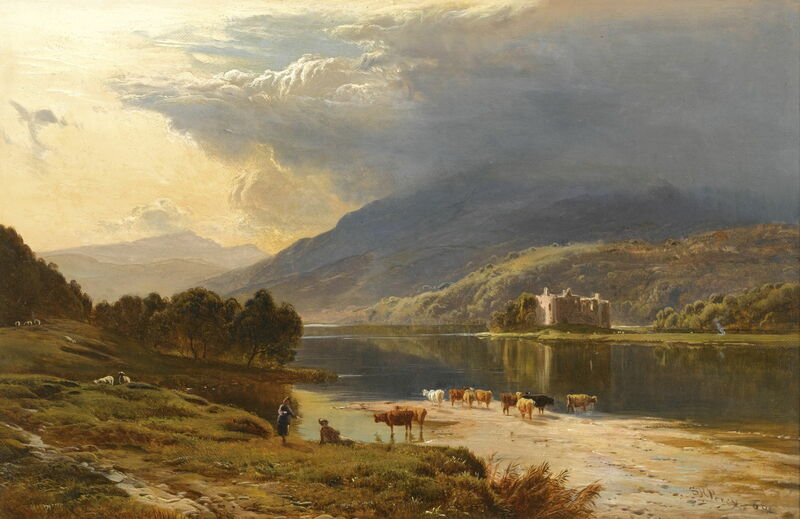 Sidney Richard Percy (1821–1886), Kilchurn Castle, Loch Awe (1868), oil on canvas, 24 × 37 cm, location not known. Wikimedia Commons. Percy’s painting of Kilchurn Castle, Loch Awe (1868) is a fine if somewhat formulaic depiction of this ruined castle on Loch Awe, in Argyll, in the south-western Highlands. Sidney Richard Percy (1821–1886), On the Road to Loch Turret, Crieff (1868), oil on canvas, 61 × 96.5 cm, location not known. Wikimedia Commons. Looking beyond the standardised staffage in the foreground of Percy’s On the Road to Loch Turret, Crieff (1868), his mountains and clouds look wonderfully authentic. This location is near the market town of Crieff, on the busy road between Perth and Crianlarich, but Percy’s track is more remote, and still little-visited. It was probably used by Highland drovers to take their cattle to market in Crieff, which was a major outlet for livestock from further north. Sidney Richard Percy (1821-1886), Carn Dearg and Ben Nevis from Achintee (1874), oil on canvas, 61 x 97 cm, location not known. Wikimedia Commons. Percy’s Carn Dearg and Ben Nevis from Achintee (1874) shows one of the finest views of the Ben Nevis massif. Càrn Mòr Dearg, as it is more correctly known, is the mountain in front of Ben Nevis, and they are connected by the spectacular ridge of the Càrn Mòr Dearg Arête, a challenging and exposed scramble. Robert S. Duncanson (1821–1872), Scottish Landscape (1871), oil on canvas, 75.4 × 127 cm, Smithsonian American Art Museum, Washington, DC. Wikimedia Commons. 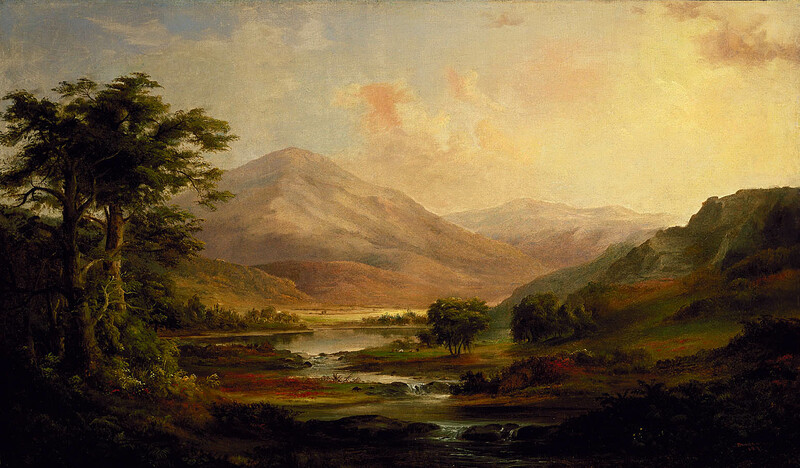 Robert S. Duncanson was an intriguing visitor, as he was a prominent landscape painter who followed the original Hudson River artists, in his case working mainly from Cincinnati, Ohio. He was also the first African-American artist to achieve an international reputation. He left the US at the start of the Civil War, living in Canada first, then moving to Britain. Duncanson visited Scotland, where he accompanied one of his best-known works The Land of the Lotus Eaters (1861) on tour. On his return to Cincinnati in 1866, he painted a series of views of Scotland, including this Scottish Landscape (1871). 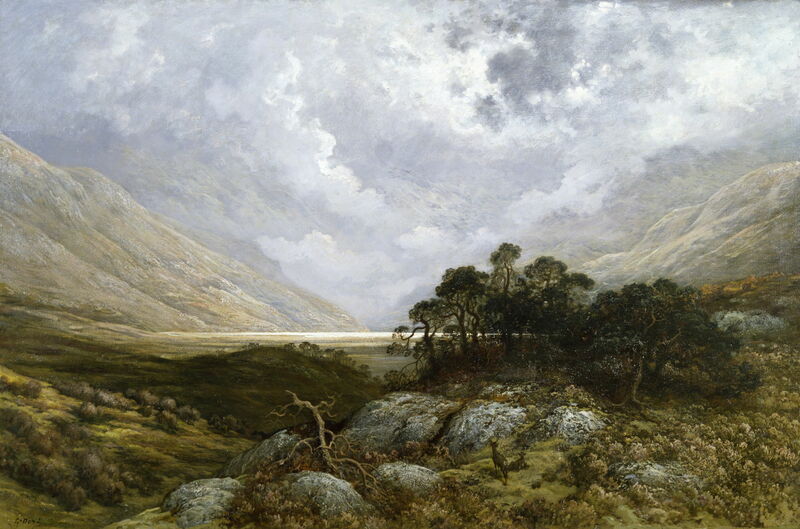 Gustave Doré (1832–1883), Scottish Highlands (1875), oil on canvas, 108.6 x 183.2 cm, Toledo Museum of Art, Toledo, OH. Wikimedia Commons. Gustave Doré was another major French artist who visited the Highlands, in 1873 to fish for salmon, and fell in love with the country. Two of his best paintings of the Highlands are Scottish Highlands (1875) above, and Landscape in Scotland (c 1878) below. These were painted in his studio from the sketches and studies he had made during his tour. Like Rosa Bonheur, Doré had good business reasons for being in Britain too: in 1867, he held a major exhibition of his work in London, which led to the opening of his Doré Gallery in Bond Street, London. He also completed a five year contract with a publisher which required him to stay in London for three months of each year. 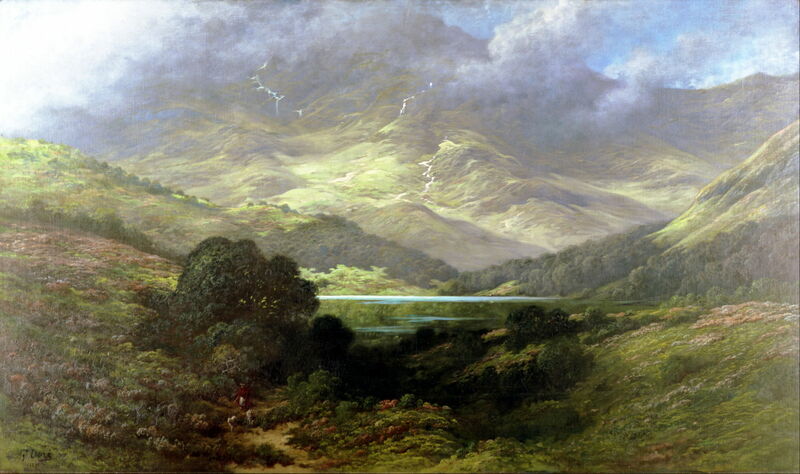 Gustave Doré (1832–1883), Landscape in Scotland (c 1878), oil on canvas, 131 x 196 cm, Walters Art Museum, Baltimore, MD. Wikimedia Commons. 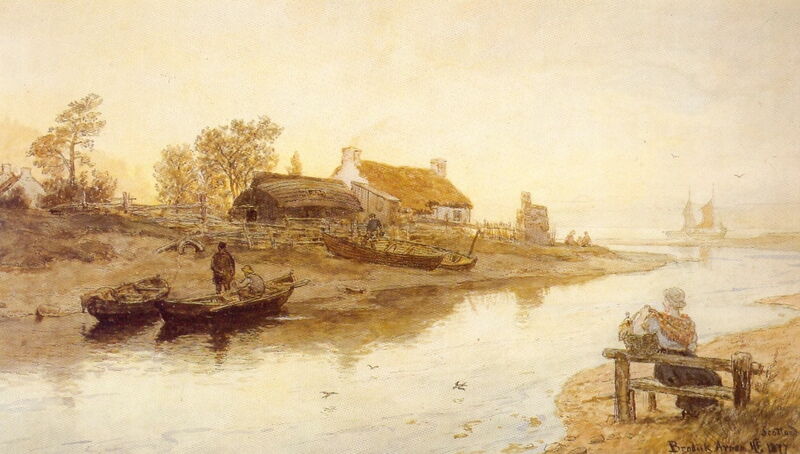 Hans Gude (1825–1903), Estuary at Brodick, Arran, Scotland (1877), pencil and watercolor, 33.5 x 57.9 cm, Nasjonalgalleriet, Oslo. Wikimedia Commons. 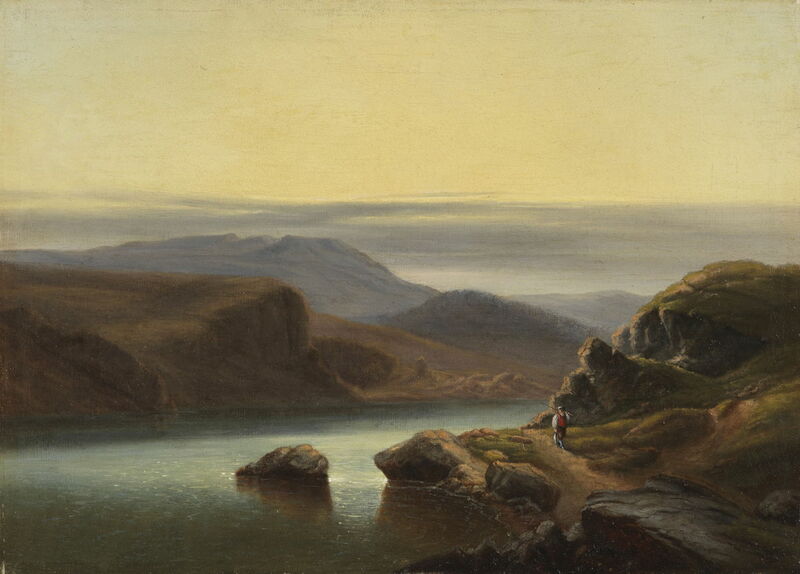 The great Norwegian landscape painter Hans Gude visited the British Isles on several occasions. The first, to Wales, was in 1862, and proved to be “useful but bitter medicine”, as he wrote afterwards. Later in his career, he visited Scotland, working largely in watercolour. This almost monochrome view of an Estuary at Brodick, Arran, Scotland (1877) shows a scene on the isle of Arran, off the coast of south-western Scotland. Hans Gude (1825–1903), Landscape with Tarbert Castle, Scotland (1877), watercolour and graphite, 35.8 x 54.4 cm, Nasjonalgalleriet, Oslo, Norway. Wikimedia Commons. 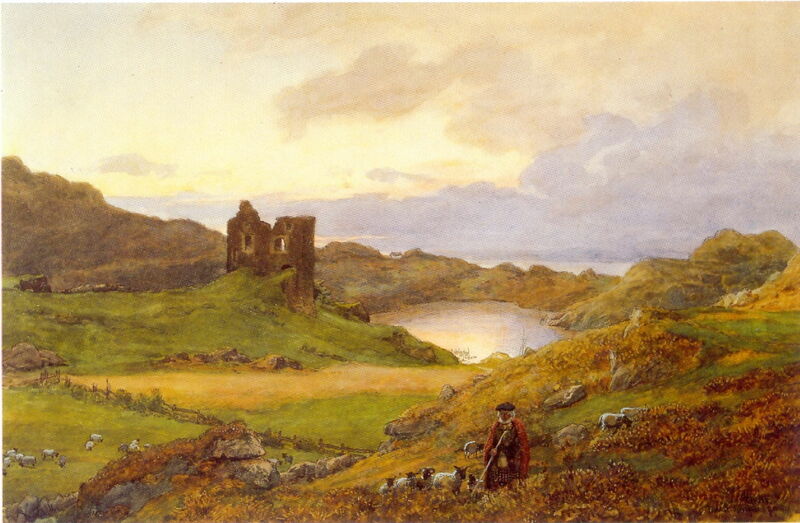 Gude’s watercolour Landscape with Tarbert Castle, Scotland (1877) shows one of the most famous ruined castles on the west coast of Scotland, on the shore of East Loch Tarbert, at the north end of the Kintyre peninsula. Hans Gude (1825–1903), Oban Bay (1889), oil on canvas, 81.5 × 124 cm, Nasjonalgalleriet, Oslo. Wikimedia Commons. 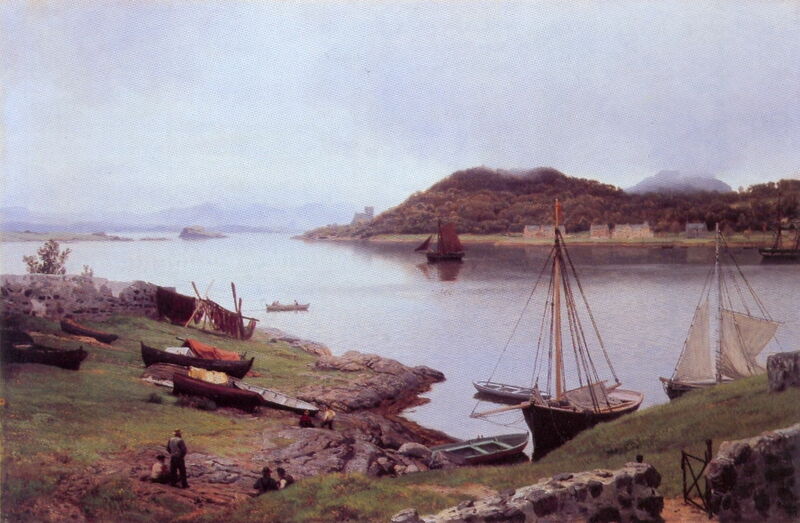 Gude also painted some oils, including Oban Bay (1889). The town of Oban is further north along the west coast. Its small bay opens out to the Sound of Kerrera, and is now a busy ferry port serving the Western Isles; at this time it seems to have been but a small fishing port. The prominent building in the distance just to the left of the centre of the painting is Saint Columba’s Cathedral, the seat of the Roman Catholic Bishop for the Western Isles. The distant mountains are those of the Morvern Peninsula, on the opposite shore of Loch Linnhe – still a wild and remote area. Charles Leslie (1835-1898), Scottish Landscape (1872), oil on canvas on wood, 30 x 60.5 cm, location not known. Wikimedia Commons. 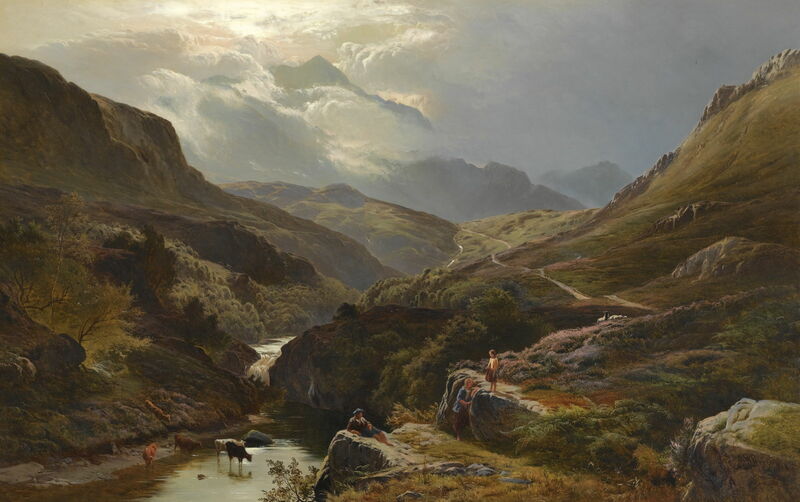 Charles Leslie was another member of the Williams family of painters, a nephew of Sidney Richard Percy, who became well-known for his fine views of Wales and Scotland, including this Scottish Landscape (1872). Frank E Jamieson (1834-1899) (attr), Scottish Lake Landscape in Front of Mountains (date not known), oil on canvas, 51 x 76 cm, location not known. Wikimedia Commons. 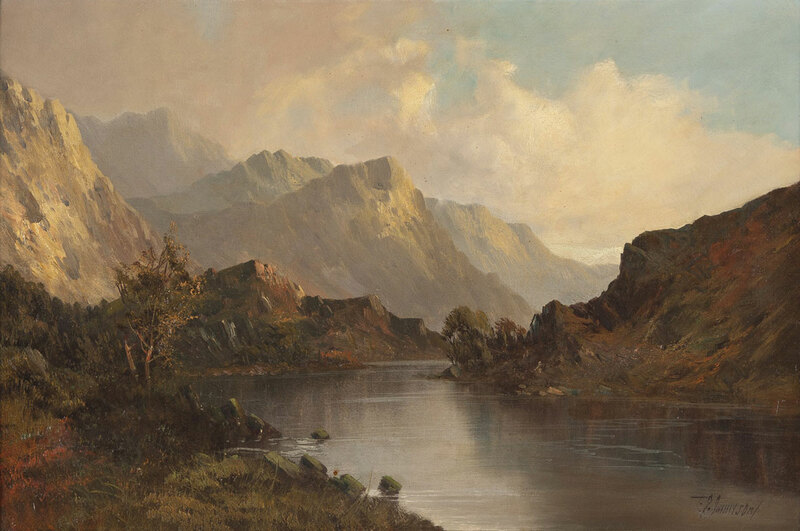 This painting of a Scottish Lake Landscape in Front of Mountains is signed by Frank E Jamieson, but that could refer to the father of that name, or to his son, Francis E Jamieson, who was a prolific commercial artist who worked under many pseudonyms. It is thought that this is another view of Loch Awe, here the hills at its north-east tip, viewed from Kilchurn Castle Island. It is thus the reverse view of Percy’s Kilchurn Castle, Loch Awe above. 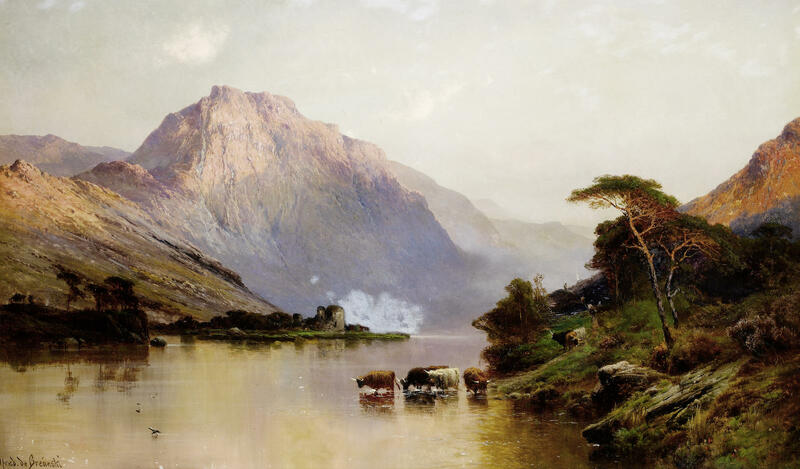 Alfred de Bréanski (1852-1928), The Eagle Rock (Loch Lomond) (date not known), oil on canvas, 41 x 61.5 cm, location not known. Wikimedia Commons. Alfred de Bréanski (the elder) was born in London, the son of a migrant Polish family of artists. After exhibiting his first work at the Royal Academy in 1872, he travelled extensively in Wales and Scotland during the next decade, achieving commercial success with his wilderness landscape paintings. The Eagle Rock (Loch Lomond) is one of several crags in Scotland known by this name, this being on the shore of the large lake which straddles the southern border of the Highlands. 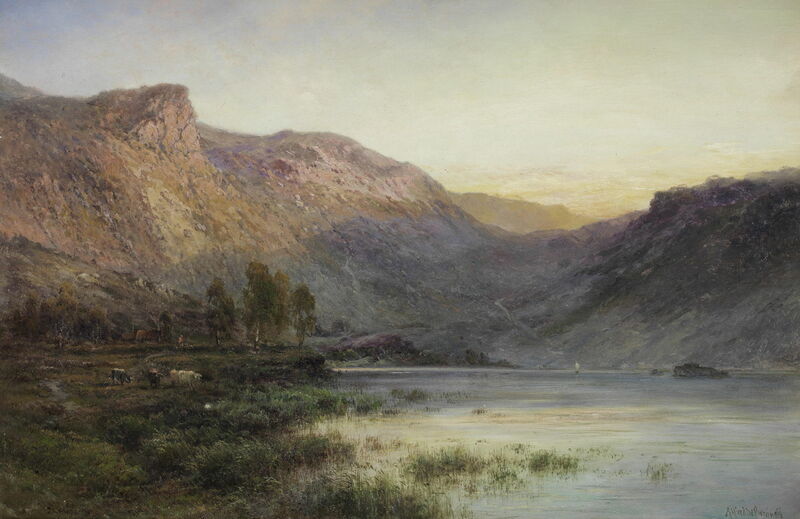 Alfred de Bréanski (1852-1928), Loch Lomond, Sunrise (date not known), oil on canvas, 51 × 76.5 cm, location not known. Wikimedia Commons. de Bréanski’s Loch Lomond, Sunrise is another view of Loch Lomond, this time in the rich light of dawn. Alfred de Bréanski (1852-1928), Inverlochy and Ben Nevis (date not known), oil on canvas, 76 × 127 cm, location not known. Wikimedia Commons. Inverlochy and Ben Nevis is a view of the Ben Nevis massif from near Inverlochy Castle, to the north-east. Inverlochy grew into a large village in the 1920s as the result of the construction of an aluminium smelter there, powered by the abundant cheap electricity generated from local hydro-electric schemes. de Bréanski has shown what I can only interpret as a large area of snow and ice, remaining at the foot of Ben Nevis, which appears unusual, although there are some other smaller patches further up its towering cliffs. de Bréanski’s Sunset in the Scottish Highlands uses rather formulaic staffage again. 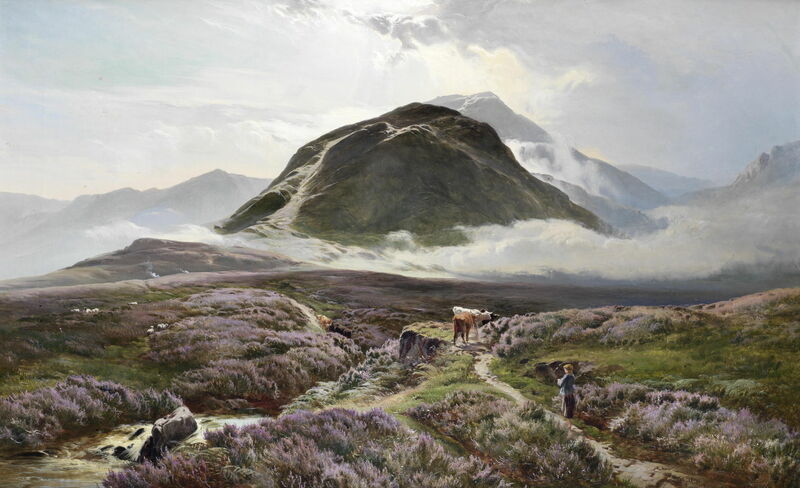 William Watson (1840-1921), Highland Wanderers – Morning Glen Croe, Argyllshire (1906), oil on canvas, 81 x 122 cm, location not known. Wikimedia Commons. This final painting from my selection was made by a British animalière, now forgotten in comparison with Rosa Bonheur: William Watson. He was a member of the Watson family of artists, the one who specialised in landscapes featuring cattle and sheep. This example of his work, Highland Wanderers – Morning Glen Croe, Argyllshire from 1906, shows a valley in the middle of the Arrochar ‘Alps’, an exceptionally rugged mountainous area of the Cowal Peninsula, to the north-west of Loch Lomond. Notable omissions from these works are both the Inner and Outer Hebrides, which have been painted more extensively by Scottish artists. Travelling around the Highlands was made much easier during the late nineteenth century with the arrival of the train. Those who wished to paint the isles of Skye or Lewis and Harris would also have had to cross there by ferry – something which was still relatively unusual for visitors. Posted in General, Life, Painting and tagged Bonheur, Bréanski, Doré, Duncanson, Gude, Hunt, Kummer, landscape, Leslie, painting, Percy, Scotland, Watson. Bookmark the permalink.